It's that time of the month.. It was a small piece Fa lalalalala, with a cute Cardinal this time.. Isn't it looking great already my SAL. Look at Rita ( will post later today) and Noni for there piece, and little Nia maybe just found her needles? As I told last Saterday it was Kingsday. It was the first time we celebrated that, after many years of having Queensday. 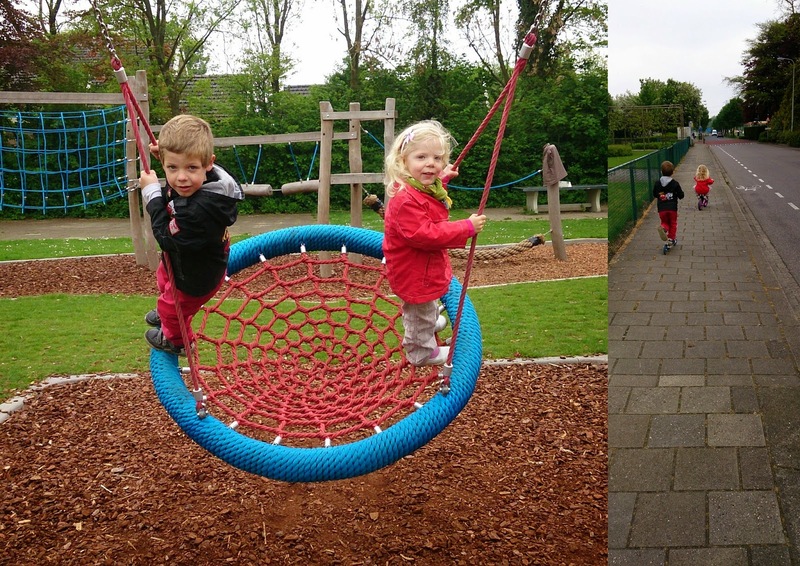 Kids had Kings play activity's at school on Friday, and saterday we had a blast at King's day. Every town and city celebrate's it. In the morning a parade, and singing the song of our country. and later a Free- market, al kids/people, every one can sell every thing, games for free. They both got a penny, and bought a gift, on the second of left above you can see Noah playing his bought gift with friends. I finished Kira her bracelets on time. Also finsihed some pink bracelets. Kira is so happy with it!!! At the moment MIL is here babysitting. I have to work the night shift, and Dh the day shift. So she is babysitting the kids. They are having so much fun!!!! This afternoon we went for a walk..
Have a wonderfull evening all, till in May!! Het jingles patroon begint er steeds leuker uit te zien! Fijn dat jullie ook hebben genoten van deze eerste koningsdag! Wonderful stitching , love the braclets , hugs. 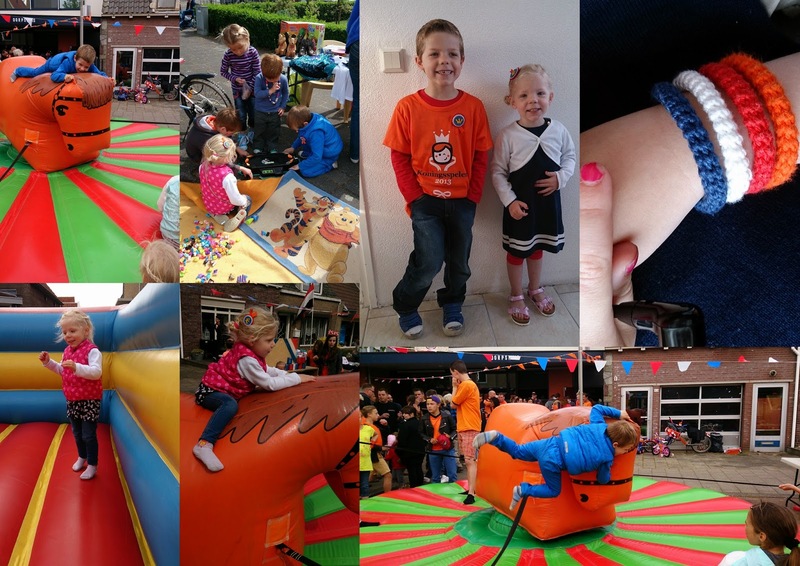 How nice that all of the towns and cities celebrate King's Day--looks like the kids had a ton of fun! Where did u find? Was is expensive? The SAL is coming along beautifully! Looks like you all had fun during King's day. Honestly, the first time i haven't been out to go and see the activities being the kids older en both working that day we went to a friends birthday instead. it's going to be a very beautiful piece ! You are not folowing the same order on the blocks? Or did you all agree to do it like that? You have so beautifull kids and they obviously have agreat bond betwen each other!! YOu stitchinga are very pretty as allways and the bracelets are super cool!! I'm a little delay with my blog readings...almost the end of the month again! !